15/55 Reagen Sulewski Ridiculously funny set pieces and character creations bordering on genius (particularly Steve Carell) but some of the more bizarre pieces fall flat. 28/92 David Mumpower Will Ferrell’s charm continues to elude me. I must not be drinking the same Kool-Aid as the rest of you. 28/48 Les Winan Should have been better than it was. Steve Carell steals the movie. 59/126 Kim Hollis Very quirky humor in an uproarious take on '70s local news. 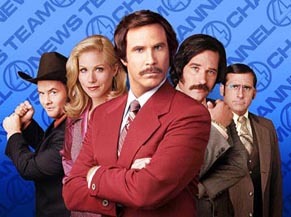 Will Ferrell stars as Ron Burgundy, an anchor at a local TV station in 1970s San Diego. His position is threatened by ambitious newscaster Veronica Corningstone, played by Christina Applegate, who joins the station as Burgundy’s fellow anchor. Burgundy at first welcomes Veronica, thinking she’s going to be covering “women’s” stories, such as cat fashion shows and the like. But when her journalistic skills begin to overshadow Burgundy, the senior newsman realizes he has to fight to retain his position, and the war of the anchors begins.